Of all the all-inclusive resorts for families, Beaches Resorts are among the most popular, according to our audience on Family Vacation Critic. 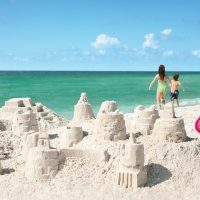 There are currently three different Beaches properties — two in Jamaica and the biggest in Turks and Caicos — and each resort features different “villages.” Understanding these oversized properties can be tricky when it’s time to choose which village is best for your family, what’s offered for kids, and what’s actually included (and what’s not). This is your guide to Beaches Resorts, in which we cover kids’ programming, additional fees, accommodations and more. The most popular of the Beaches Resorts is its Turks and Caicos property, located on Grace Bay. This property features four “villages” — resorts within resorts: Caribbean, Italian, Key West and French. In Jamaica, visitors can select Beaches Negril on 7-Mile Beach with its Caribbean and Negril-themed villages, or Beaches Ochos Rios, with its Caribbean, French and Greek villages. Beaches has programming for all ages. Infant programming starts with newborns up to 24 months receiving supervised care from certified nannies from 9 a.m. to 9 p.m. Toddlers, ages 3 to 5, have their own programing. Special programs for pre-teens ensure they don’t hang with the little kids or annoy the teenagers. Teens have their own programming, safe but away from their parents. Perhaps it should be what isn’t included at Beaches. Practically anything you can think of in an all-inclusive stay is included. Let us count the ways: water parks; water sports, including unlimited scuba diving; land sports, such as tennis and golf; entertainment; kids’ clubs, featuring the Sesame Street characters; an Xbox Play Lounge; tween club; teen nightclub; and a miniature train ride. The resorts, of course, also have multiple pools and kiddie pools. All dining is included at Beaches, as well. There isn’t a special celebrity chef restaurant that requires a separate bill and reservation. At the Turks & Caicos resort, that includes 19 different restaurant options. At the smaller Negril location, you’ll have nine restaurants to enjoy, and seven restaurants at the Ocho Rios resort. The resorts also provide direct round-trip airport transfers, so guests don’t need to arrange their own transportation. In Jamaica, Beaches operates an Airport Lounge with seating areas, TVs, unlimited beverages, restrooms and more. You’ll have to pay for DJ Scratch Academy (where teens can mix their own album), Caribbean Adventure Tours, spa services and private candlelight dinners. After-hours care and care for children with special needs is also available, but these come with additional fees. The Special Needs program is available from 9 a.m. to 9 p.m. for $8 per hour. When kids’ programming ends at 9 p.m., families can hire professional nannies for $10 per hour at the Jamaican resorts and $15 per hour in Turks & Caicos, up to 11 p.m.
All rooms and suites at Beaches are categorized as Luxury Level, Concierge Level or Butler Level. Concierge Level guests receive their own check-in area, a weekly reception, a stocked in-room mini-bar, and help making dinner reservations. At the Butler Level, guests receive private butler service with top-shelf drinks en-suite and in-room dining service. Each resort features a “resort-within-a-resort” through its different villages. Beaches Negril only has two options: Caribbean and Negril, although here, they aren’t so much separate villages as they are different room types. Rooms begin as Negril Deluxe rooms that can accommodate three and grow in size and price to the Negril Beachfront Concierge Family Rooms that sleep up to eight. The Caribbean section is all-suite, beginning with the Caribbean Beachfront Concierge Suite for five and growing to the Caribbean Beachfront Three-Bedroom Butler Suite that sleeps up to 12. 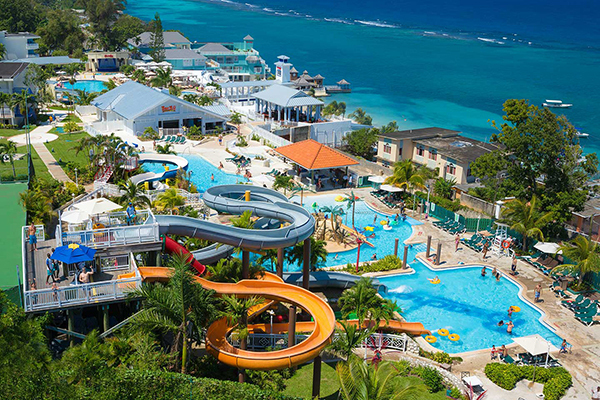 The larger property in Jamaica, and the one closest to Montego Bay and island attractions, is Beaches Ocho Rios. Here, the traditional rooms are offered in the Caribbean Village, with all rooms accommodating up to five. These rooms often have garden and resort views and are furthest from the beach. Bump up to the Concierge Level, and you’ll find rooms on the top floor of the Caribbean Village, as well as suites with ocean views (and closest proximity to the beach) in the French and Greek Villages. They sleep four to five people. The largest of the Beaches properties is Beaches Turks & Caicos. This resort can be especially confusing when trying to select room types because there are so many options. The smallest and most inexpensive room types at this resort are found in the Caribbean Village, with views of the resort, gardens or pool; they sleep up to four guests. More garden and pool views are available when you bump up to the French Village Luxury Rooms, also sleeping four. Larger rooms are available in both villages in the form of suites, which can sleep up to 14. The large accommodations are more commonly found in the Concierge and Butler suites. In Key West, the rooms are more expensive than Caribbean and French rooms, and are Concierge rooms. The most standard is a garden room that sleeps three. 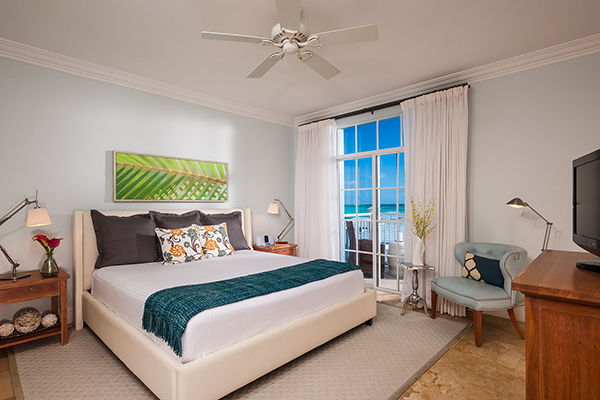 The Key West Village’s largest room sizes are four-bedroom Butler Villas that sleep up to 10. The most luxurious of all the villages is the Italian Village, which also provides the most room for families. Here, all rooms are also Concierge rooms and suites, with the entry level room a Family Suite with separate kids’ room that can sleep up to six. The Italian Village’s largest room sizes are two-bedroom beachfront family suites with butler service. These suites overlook the ocean, with some providing walk-outs right onto the beach; they can accommodate up to 12. Each Beaches resort has been visited by a member of the Family Vacation Critic editorial team and has received a Family Vacation Critic Favorite seal of approval. To see each room type, restaurant, and activity available at the resorts, visit the reviews below. You can also check rates at the resorts by entering your dates. Which Part of Puerto Rico Should My Family Visit?